The Horrocks store on Capital Avenue SW in Battle Creek. Easily, one of things I like the most about Lansing is Horrocks. We’ve saved so much money and gotten some great stuff at Horrocks in Delta Township. When produce is in-season, Horrocks is a once a week trip. During the winter, it turns in to a bi-monthly or monthly trip but still something I look forward to. J and I met her parents in St. Joseph for Mother’s Day brunch. 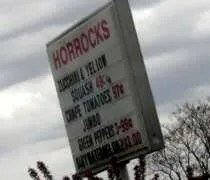 On the way home, J suggested stopping by Horrocks to get some fruit for the week. Since it was on the way, I suggested we check out the Battle Creek Horrocks. The Horrocks on Battle Creek is near I-194 on Capital Avenue SW. The building looks to be an old office building or something. The store is in a pretty industrial area, so the previous tenant of the building could have easily used the building for anything. When you’re within a couple miles of a Whole Foods Market, you have to go. Right? That’s the case with us anyway. We were in Willowbrook for lunch at The Chicken Basket and J said there was a Whole Foods right down the street. It’s the store where she was first introduced to the store we’ve come to lovingly call Whole Paycheck (thanks Amy). When we lived in Peoria, J would make the drive to her parents house quite often. On those trips, she and her mom would run to Whole Food and stock up on pre cut fruits, veggies, and those delicious pre-made salad. 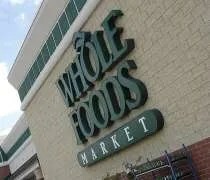 Whole Foods has a number of markets in the Chicago area. The Willowbrook location is on 63rd Street right off of Kingery Highway (IL-83). We actually drove by it the first time because J thought it was visible from Kingery, but we found out pretty quickly, it’s not. The store is a stand alone and the parking lot is really tight. Whole Foods is definitely not your typical mega mart with concrete parking lots as far as the eye can see. There’s plenty of parking, but it’s not spread out and there’s not a lot of empty spaces. Handy's Food Market on Willow Street in Lansing. 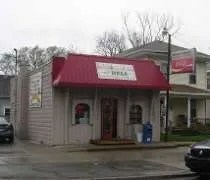 Handy’s Food Market is on Willow Street at the corner of Chestnutt. It’s a really small building with just a little bit of street parking. There were already three or four cars parked out front, so I had to go down the street a little ways to find a spot. Like I already mentioned, there isn’t a lot of room in the store. There’s one shelf that runs through the middle of the store and divides the space in to two. With the aisles that are left, there’s not enough room for two people to pass by comfortably. I found the spice section I was looking for, but again, couldn’t find what I was looking for. I found whole ancho chile’s, but no powder. Before I left, I also noticed some hanging above the counter, but still, no ancho chile powder. 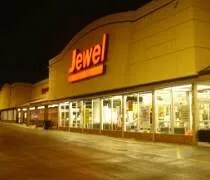 The Jewel-Osco store on Washington Avenue in Kankakee. When you grow up in a small town, the closest supermarket isn’t always just around the corner. In our case, the closest supermarket is a half hour away. My family doesn’t have the luxury of deciding what they want for dinner then running to the store to get it. I grew up in a time where there were no hypermarkets and supermarkets were a once a month trip. The only one of those big chains that is still around today is Jewel-Osco. Jewel-Osco started life and Jewel Food Stores and Osco Drugs. Somewhere along the line, they merged to become Jewel-Osco. The weird thing was, they were almost always in the same building and connected. Osco was more like Walgreens with some items and Jewel did the food thing. When other supermarkets started doing pharmacy’s along with some merchandise, Jewel and Osco just merged together. I remember how this store used to be set up and it always seemed dumb. There were two separate entrances and a hallway connecting the two stores, but you had to pay for each stores merchandise in their store. Now, pretty much all Jewel-Osco stores are in the same building even though both brands usually have their own management teams and marketing identity. 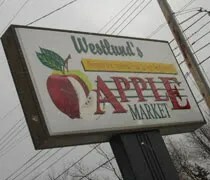 J and I had both seen the recent commercials for Westlund’s Apple Market touting $1.69 ground beef. She doesn’t eat ground beef that often, but I could live on the stuff, so on our way home from Howell, we decided to check it out. Westlund’s in on Grand River a few blocks from Frandor. I don’t know why, but I was expecting it to be out towards Eastwoode. I thought my GPS was screwed up when it turned me left on Grand River from US 127. J kept assuring me that is was the right way. She could remember driving by it, but I couldn’t picture it. 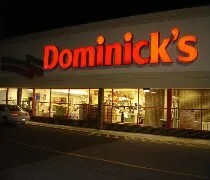 Dominick’s is chain of supermarkets that got it’s start in the Chicago area by Dominick DeMatteo in 1918. The first supermarket was opened in 1950. They sold the chain in the late 60’s, but they were so unhappy with the agreement, the family bought the chain back in the 80’s. In the 90’s, Dominick’s was an innovator with POS systems, cafe’s, video rental, and many other things that are now commonplace in most major supermarkets. Dominick DeMatteo died in 1993 and the family put the comapny up for sale. In 1996, they were sold to LA based Yucaipo Co. A few years later, they were sold to Safeway Inc. At the time of the sale, there were 116 Dominick stores. After years of trying to change the financial structure, Dominick’s now operates 83 stores. We only needed to pick up a few things and they were pricing those items for holiday sale. I picked up three packages of cream cheese, a can of sweetened condensed milk, oreos, and a springform pan. The items rang up to $28, but after the sales were applied, it was just barely over $21 with the pan taking up a good chunk of that price. I didn’t really get a whole lot that warrants a review and it’s not like most of you are going to run to a Dominick’s to go shopping, but I did want to throw out a little history of a Chicago institution and something you won’t be able find in many markets. Kroger in the Frandor Shopping Center. I have a feeling one day I will visit all the Kroger’s in Lansing. For some reason, when I need something, I instinctively go to Kroger. 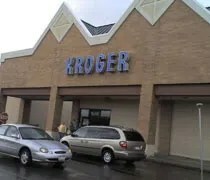 Maybe it’s because I’ve been around Kroger all my life whereas the other supermarket’s in the area or foreign to me. Maybe it’s because there just always seems to be a Kroger when I need one. J and I were in Frandor to check out Linens ‘N Things again. My dad wants some pans for Christmas and he’s very, very picky about what he wants, so we were hoping to find something cheap at LNT. They just lowered their prices again, so we thought it was a good time. We picked up a few things there, but I needed to pick up a few groceries as well and there was a Kroger not too far down the parking lot.